Yeah, that about says it all but there's more. 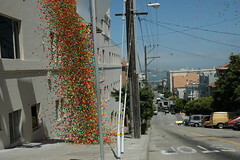 There was a film crew shooting an ad in San Francisco that called for the dropping of 100,000 bouncing superballs. Oh yeah, its even better at maximum resolution or even large! There are more pics where this one came from but this is cream, so far as I could tell. Really pretty amazing stuff. And all from a wee dollop of rubber, some color and gravity. Sweet! Thanks to Jay for the headsup!